Bloch's "Neo-Flex" slip-on jazz shoe features a leather upper with neoprene mid-section to hug the arch. This shoe also features a rubber split-sole. One of my favorite jazz shoes. I order same size as my street shoe and after a few classes the leather gets broken in and it's a perfect fit. Only complaint is that if you tend to put a lot of weight into your heels, the heeled part of the shoe will sink into itself and it doesn't hinder the shoes performance, but it doesn't look as nice. After reading many, many reviews I decided to choose these shoes for my jazz class. I read in many that they run small, so I got a size 9 my street size is 8-8.5 and they fit perfectly. I also have somewhat wide feet and they seem to accommodate for that as well. I haven't danced in them yet as they just arrived today, but I would definitely recommend these to anyone who needs jazz shoes. My daughter normally has to order a wide width even though she doesn’t have wide feet. I find the tap shoes and jazz run narrow. The actual shoe was fine, but DEFINITELY not true to size and I just don't want to go to the hassle to return. My daughter has worn this dance shoe for years as it has been the team pick for both her competitive studio dance team, as well as her High School Dance Team. They look good on the foot and perform well. They have made improvements over the years so durability has greatly improved. The stitching between the the neoflex and leather portions of the shoe used to pull out and require a good deal of repair. That no longer happens so these comments make a difference. They really show off a well pointed toe. Our dance studio changed to this shoe and almost all the parents and girls are not happy. It fits hardly anyone. One size is gapping at the sides- too big and the next size down, even half a size, is too tight. My friend said her daughter's are falling apart after a short time. I see no reason to buy these accept when you have no choice like us. These are my absolute favourite jazz shoes, and probably the best, ever! The elastic goes all the way around the shoe, so it's good for arch support. The durability is average, I've only worn them for 2 classes so far, and they've got quite a few scuffs already. However, this is the best fitting jazz shoe I've worn. I was told to size up because they run small, I'm typically a 9.5-10, so I got the 10, and they were too big, the smaller size may be tight, but they'll stretch quickly. These are true to size! Bloch seems to run smaller than usual? I have worn bloch jazz shoes for I don't know how long and all of a sudden they seem to be running smaller. Or is it just me? All my other 7.5 dance shoes fit. I got these in an 8 and they are still too tight. All of the shoes are great. Make sure to avoid getting jazz booties wet. They will get ruined by mildew. I thought these shoes would NEVER wear out. My daughter's foot finally stopped growing several years ago. She has had the same pair of jazz shoes for over 3 years! She is in the most advanced Jazz class in her dance school. That shoe has seen so much dancing, it finally just wore out. After 3 years of intense use, the shoe just doesn't have any more elasticity in the stretchy parts, so the heel keeps coming off while she is dancing. But WOW! 3 years! I am totally impressed with this shoe. She loves it, it's comfortable, and they certainly pass the durability test. I teach in these 3 days a week and I have had these for about a year and they have held up great! Of course the traction on the shoe is going but overall the shoe is still together with no holes! These shoes are comfy for long days. My dance team wears them between 1 and 3 hours and they are great. My daughters like these shoes- we've had a few pairs now over the years. My 10 year old wears a size 3-Child, which is the same as a 5-Adult. These shoes run small, so I bought her a size 6-Adult and they are perfect. When in doubt I always size up, since they can always grow in to them later. These are my favorite brand of jazz shoes. The special designed arch hugs your foot and enhances the shape of the arch. The soles provide excellent traction on the floor to minimize slipping, but at the same time does not affect doing multiple turns. Mine didn't get a hole in the toe until almost a year after purchasing them. The tan color matches well with most tan colored tights and the black is a true black. These shoes are perfect!!! Many people at my studio have these shoes. Many people in the reviews say they run small. I looked at what size they said their kids are and what size they bought and they didn't even look at the size chart. LOOK AT THE SIZE CHART!!!! It is their to help you. If you follow it you will get the right size. Overall looks very good, feels good, and a good price. We purchased these block jazz shoes in black for my 12 year old daughter. She had already worn the same shoe in tan and was very happy with the fit and I was happy with the durability. Unfortunately, the black color wears off on her feet, to the point that the balls of both her feet are a purplish color that won't wash off. She still finds them comfortable, but is having to wear footies under them. She dances 15 hours a week, so shoes don't last too long anyway, but I will be looking for another brand of black jazz shoes next time. the product looks great I will have to exchange them into a bigger size, but they look very comfortable. I have been dancing since the age of two, and now I am 12 and I have been wearing this style of shoe for a long time. I have tried seven different styles of jazz shoes and these are my favorite. I have gone through 4 pairs of these! I take jazz multiple times a week and in the advanced class, and these hold up better than any of my other shoes. Since I dance so much in them they get scratched up pretty fast, but if you take care of them, you will love them like I do! I ordered an adult size 4 for my daughter who wears a size 3. She is 9 years old. They do not fit her... but they fit my 7 year old who is normally a SIZE ONE!! SO MISLEADING!!! NOW I HAVE TO ORDER ANOTHER SIZE!! I have used this shoe for 4 years and still love it. Very comfortable and great support and grip for turns and leaps. I usually wear a 7.5-8 in street shoe and always order an 8. The shoe always starts off a little tight but definitely forms to your foot after a few rehearsals. I use these shoes 5 days a week for 3 hour rehearsals and 2 hour performances and my toe usually begins to pop through after about 8 months of intense use which is usually expected. Would highly recommend this product. The site doesn't tell you that these shoes run small, I had to look at previous reviews for that information. I ordered a half size bigger and my toes were a bit squished. I would send them back for a larger size but I didn't know that the company put a breakfast bar in the package and my dog decided he would be the first to open it. I wish I had been told before hand that there would be a sample of food because he did bite the shoe a tiny bit. I would recommend that anyone buying this shoe get a full size, size and a half bigger then they are or else they will have to stretch the shoe out. I love Bloch shoes. They are the only ones that fit well. In this jazz shoe, for me, they ran small. I ordered an 8 (which is the 1/2 size larger than my shoe size of a 7 1/2). They felt too short and my toes felt crunched at the top. So I ordered another pair in an 8.5 and they fit great. I plan on ordering a black pair as well. I normally wear a 6.5 in street shoes and read that these run small, so I ordered a whole size bigger - 7.5. They were still a tad too small, so I will return them and get a size 8. 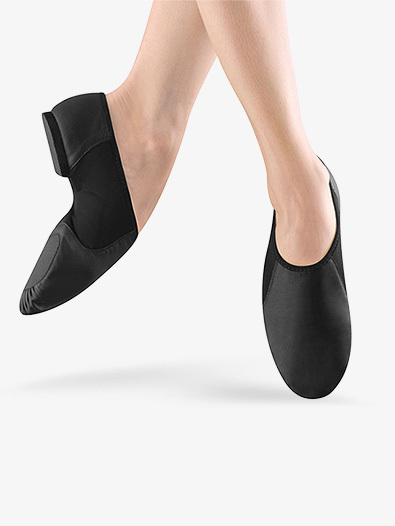 I do like the look and feel of the Bloch jazz shoe so once I get the right size, I'm sure I'll be happy with them. My daughter has been wearing this particular jazz shoe for 4 years now. In our experience, the size of her jazz shoe is only 1/2 size larger than her street shoe. She currently wears a size 8-8 1/2 street shoe and her jazz shoes are 8 1/2 in black & 9 in tan (the size 8 1/2 fits her perfectly and the size 9 are just a tad roomy). My suggestion, order 1/2 size larger than street size (if your child's feet grow fast, order up 1 full size). This is our personal experience - hope it helps! I got these shoes since my old So Danca ones were finally done. Definitely listen when it says to go up a half size. I normally go with 7.5, and the 8 fits perfectly. They break in really easily, but definitely wear what you would for performance with them the first time you dance in them. So if you normally dance with tights, do that. Barefoot, etc. I especially love the elastic split sole design that this has! It allows for really pretty lines and ability to really work on your feet and arch etc. without being crazy stiff or anything like that. 10/10! Favorite jazz shoes! I bought this shoe for my 13 y.o. daughter who has a wide foot. This shoe is MUCH easier for her to get on than the others we had which had only one elastic gusset on the top of the foot. They are very comfortable for her to wear. We did order half a size larger than street shoe size--based on other reviews. This was the perfect size for her. The shoe fits nicely on her larger foot, but is not so large as to slide around on her smaller foot (which is a full size smaller!) I am very pleased and will buy these again for her. And as soon as my son outgrows HIS jazz shoes, we will buy these for him as well. These are GREAT for wide feet! My daughter has danced for over 10 years and this is first time I have ordered Bloch brand jazz shoes. These ran much smaller than expected and will have to be returned. Should have stuck with So Danca brand. very comfortable. Definitely listen when it says to order 1/2 size up. Very easy to turn in! Very easy to turn in! I loved it! It was soooooooooooo easy to turn in and felt like you weren't wearing anything. If it is a it small, it will stretch. I love it so much! My daughter is taking dance class for the first time and so this is the first pair of dance shoes I have ever bought. I wasn't sure what size to order for her since I saw so many of the reviews were saying that the shoes run very small. She wears a size 8 1/2 in street shoes and so I ordered her a 9 in the dance shoe, just to be safe. Her feet are also very narrow and so I didn't want to get them too big and have them falling off her feet. It turns out that I could have ordered her an 8 1/2 and they would have been fine. She can still wear them since they are only a half size bigger than her normal size. But I wear a size 9 in street shoe and when I tried them on, they fit me perfectly. I also have a very narrow foot. They are just a little big for her but she can get away with it. I would say to order the same size or just a half size bigger than your normal street shoe size. The shipping was super fast. I got them WAY before I thought I would. They fit great! Just how they're supposed to. Very pleased. I loved these shoes the first day I tried them on. They are so comfortable and help me turn better. They mold perfectly to your feet so that you don't have and trouble dancing in them. I am going to buy my next pair of jazz shoes with this exact brand! Just received these shoes for my 9yr old daughter...size 3 street shoe. After reading the reviews, I ordered 2 sizes up, a size 5. They are perfect! Look to be good quality too. We'll see. The first time I got these, I tried them on in-store. The black ones run a little smaller than the tan. They stretch (especially the tan), so it's okay if they're a little small when you first try them on. I wear a 7 in street shoe, and I have a size 8 in these shoes. However, there was a mix up at the store where I got them, and I was given one size 8, and one size 8.5 for the tan. I didn't notice until I looked at the size, and they feel the same now. I wear the tan about 8 hours a week, and they've gotten some stretch marks near the toes, but not too bad. They hurt so badly when I first wore them, but they fit like a glove now!!! The black ones have never given me a problem. These are great shoes!!! These jazz shoes are my fav pair of shoes in my closet. I use them twice a week for dance, since i have lyrical, hip hop, and tap the other days and the haven't gotten a hole yet. i got them in black and was afraid that they would be off black but the color was right on! i would recommend this to anyone! This has been a great shoe for my daughter. The split sole gives her greater control and range of motion. The shoe is well made, comfortable, and durable. We like it so much we are buying another pair as she has grown and needs a larger size. love,love,love these jazz shoes. They are really comfy and I would prefer wearing these over any lyrical shoes or foot undeez. These stretch out, so order them snug. I love these shoes and they still look brand new after a year of dance classes. They were a perfect fit. Well made and quickly shipped! Bought these in tan about a year ago. I wear a size 6 street shoe and got the same size in these - they fit perfectly and are very comfortable. They look nice on your feet. The color seems to fade a bit after a while. Other than that, they're great shoes and they fit the same as a street shoe. Not sure why everyone thinks they run small, they're supposed to be tight and stretch out as you wear them. Very pleased with speediness I received order. Not pleased with sizing. Read sizing chart & reviews before ordering for my daughter. She wears a street shoe size 9. Took recommendations from other reviews and ordered a size 10 (one size larger.) The shoe was too long. Way too wide at the heel and just fell off her foot. These do not come in a narrow width. Returning these and ordering a completely different style. Tried on the Bloch Pulse Jazz shoe at a store and she loved these. The fit and curve were beautiful on her foot. Will be ordering the Bloch Pulse instead. defo order 1.5 size over street shoe, I ordered 1 size over and they are really snug,, hope they stretch out a bit! 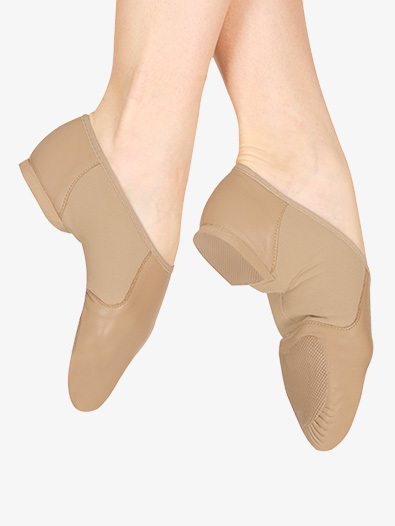 I ordered a tan size 7 of this shoe for my coming dance show in May, and I was quite dissatisfied by the condition of it. My normal street size is a 7.5 and this shoe fit pretty snug. However, the inside of my shoe had discoloring in certain areas that looks like the result of a bad gluing job. The fabric of the shoe was stitched back closed near the heel and you can clearly see the left over fabric sticking out. My feet are also wide, so this shoe was quite tight, unlike my Bloch black lace up jazz shoes. Although, if you have normal feet unlike me, these shoes are pretty comfortable. I don't really see why everyone complains about sizing, you're suppose to go down half a size for the shoe, it's suppose to feel small because it stretches. Order a one size bigger or a size and a half. They are nice shoes, but frustrating because you have to pay shipping to return item. The shoe is no longer on sale now and if I did re-order the re-shipment fee is 5.95 and it would take two to three weeks to get them. So, I will just return them order a new one and have to pay shipping again. Great shoe for a great price! But please size up at least 2 -2 1/2 sizes. I consulted with customer service about my daughter's street shoe size and foot in inches. And I still had to return them for a larger size. My daughter is a size 3 in regular shoes and we originally ordered the 4.5 based on the recommendation of customer service and the website. And she couldn't even put her foot in. So I ended up ordering the 5.5 and these seem to be perfect. Its a quality shoe and very comfortable! These shoes make my point look great! I read reviews before I purchased and all recommended that you order a whole size up. I went ahead and ordered a size up and it would have been a better fit with only a 1/2 size larger. I have wide feet and I noticed that these are really comfortable and none of the seams irritate my feet. This is the second time I have ordered these jazz shoes for myself. Had them in black and wanted them in tan. I ordered my normal size first. This time the shoes were way too small and I sold them to someone with a smaller foot. So, then I order the next size up. Still way too small. Why can't the sizing be consistant?? The construction and product is great, but if you can't trust to order your correct size, or even a size or 2 larger, and have them fit correctly without crunching your toes - then what good is ordering? Good quality shoes but they run much to small. Granddaughter's shoe size is 6 so I ordered a 6 1/2. I'll have to return the shoes and reorder in a size 7 1/2 or 8. Buy a whole size larger than street shoe or you will have to return. I read the reviews and they told me to buys a whole size up. I followed the person advice and when the shoes arrived, I was glad I did. They look and feel great! This jazz shoe is the best jazz shoe I've ever worn. I wore Capezio and Sansha but they never lasted me longer than 2 months. I have been wearing these for a year, and they still look almost brand new. I don't like lace up jazz shoes, so when I found these slip-ons I fell in love. They are breathable, stretchy, and the split-sole feature really shows off your arch. My only concern is that it runs small. I am a 9 in street shoes and ordered a 9 1/2. I will be getting another pair, but next time I will be ordering a 10. I recommend ordering almost a whole size up. Otherwise, best shoe. These are my favorite jazz shoes!! They are very comfortable and present your feet well. I love it have the whole arch is stretchy, it makes everything look much better! If your a looking for jazz shoes, these are the best out there! I spent time and money shipping Bloch toe-shoes back and forth a few years back. Deja-vue! My daughter wears a 5-6 street shoe. We bought size 5. Her friend is here who is tiny and wears a 2. It is a half inch smaller than her foot on the outside. I guess we're going to round up and add 2. I'm starting to think that that's what they're trying to say in the sizing guide, but it was unclear to me. Round up and add 2! These jazz shoes fit my daughter well, they came a little big but still snug enough for her to dance in without the shoes falling off. I followed the sizing guide exactly and came out with a good fit. I love the quality and price of the shoe. I am a little disappointed on the sizing. The sizing chart says to order street shoe size to 1/2 size bigger. I ordered 1/2 size bigger and were still to small. Then when I return to exchange them it cost me to ship them back then was charged to have the new size shipped back. I love these shoes! I jut got them today in the mail. I got my street size (8) Like other reviewers said, it's a little tight when you FIRST put them on, but dance a little in them, and they stretch out. If I were you, I would not order a size up, or they might stretch out too much. (In fact, I even have some room at the top of the shoe). Anyway, these shoes are beautiful and super comfy. They're very light in weight. My only complaint is that on bottom of the inside of my left shoe (where the arch is), there's a little place where the stitching is a little...rough? or hard? I'm not sure. It's not a defect. it's just a little spot, but it hurt my feet when I first put it on. However, I just scratched that part a little until it became softer and it's not a problem now. I love these shoes. They don't stretch around the ankle like most jazz shoes and the are extremely comfortable. They are also really good to turn in (good traction, but smooth enough to turn easily). The only down sides are that the shoe stretches A LOT, so order a smaller size, and the shoe becomes discolored after a couple months of use. Otherwise, these are a great shoe, best ones I've ever worn. I really like these shoes. The arch insert feels really nice against my foot and looks good on my feet. The fitting guide is pretty much spot on - I am a size 6 1/2 in street shoe, and I wear a size 6 1/2 in these shoes, and they were slightly tight, but stretched quickly. So if you are consistently a certain shoe size and like your toes to touch the tip of the shoe like me, order that size. but if you like a roomier shoe then go up a half size. I recently bought this shoe for a musical theatre production, and it is the best jazz shoe I've ever owned. Unlike most shoes the mesh-flexible part goes all the away around your foot and not just on the sides, which is great for people with high arches. I just like to walk around in these shoes they're so comfortable, but they do get very very dirty. Love these they are easy to turn and look very clean I also love the arch! Got the black for my daughter at the studio, now ordering the tan from here. Way better price here! :-) The shoe is very nice, she really likes it. Warning- It runs really small. She wears about a ladies 7.5-8 street shoe and was fitted to a 10 in this shoe. We love these shoes. I have one daughter that wore them for competition and loved them. I bought them for the other daughter. She wears a street shoe of 7 1/2 and I bought a jazz shoe 8. A little too small. Would better fit a street shoe of 7. Best jazz shoe I've ever owned! These shoes are the best! I've had a pair in black for 3 years and they still look great! None of those annoying wear marks... I'm getting another pair in tan for our dance show this year! Definitely go with the recommended half size up. My 10 year old daughter wears a size 4 in street shoes, what size would she need? The manufacturer suggested sizing is to order same to 1/2 size larger than street shoe size. Please note, however, sizing cannot be guaranteed. How does sizing work for tan? One review said black runs smaller than tan. I know that black runs small since I wear a ten street size but the 11 fit perfect. Now I need tan and I'm not sure what size to get. I would recommend ordering the same size that you ordered in Black. My daughter wears a size 2, what size would that be equivalent to in the Bloch Neoflex Jazz Shoe? The first thing you would need to do is convert her child size to adult. To do that, you would add 2 sizes. She would then be a size 4 adult. From there, you would go by the suggested fitting for this shoe which is "Women order same to ? size larger than street size". Are these the only colors this shoe comes in? I've needed this shoe in "taupe" for 2 years now, and 4 more to come. I was just wondering if you will ever get it in that color? That color has been discontinued by the vendor, they do not carry it any longer. i want to ask the the size of shoe. Adult 4, 5, 6 ....ect is it a austraila size ? The sizes on our website are adult US sizes. My boy wears a street size 5. What size shoe should I order? Boys size 5 youth should order a size 7.0 in most unisex shoes. This Bloch shoe is one of our best sellers and great for dancers of any level.